Looking for the perfect gift for game console players and techies this holiday season? Give them Energeyes Digital Lenses, a protective eyewear that helps guard their eyes from the harmful blue light that causes digital eye strain. 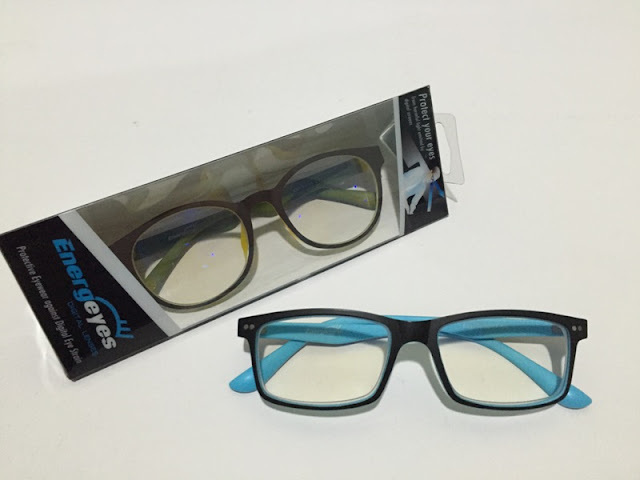 Energeyes is a defense eyewear that helps alleviate the symptoms of digital eye strain by blocking over 50% of harmful blue light through the synergistic actions of a reflective front surface treatment on the lens and an absorptive lens material. With the prevalence of electronic devices like smart phones, tablets and computers, people are spending most of their time in front of these gadgets. Techies and game console players specifically, who allot a large portion of their time, are likely to have the common eye disorder called digital eye strain. Digital eye strain is a condition caused by prolonged exposure to harmful blue light from digital devices. Its symptoms include constant headaches, eye fatigue and blurred vision. While digital eye strain may be temporary, it may result to a more serious eye-related disorder if not addressed soon. Energeyes Digital Lenses blocks out damaging blue light and improves visual performance by eliminating glares from digital screens. Energeyes is now available at participating Ekotek branches, and select Apple Stores such as iStudio Shangri-La and iStudio Gateway. Visit these stores and branches for the perfect defense against digital eye strain. ‘Tis the season of caring for your loved ones’ eye health with Energeyes Digital Lenses. To know more about Energeyes Digital Lenses, log on to http://www.energeyes-eyewear.com/. 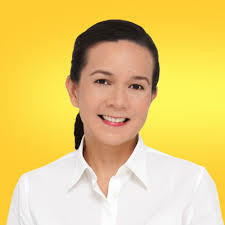 In anticipation of the 2016 national elections, real estate website Lamudi Philippines (www.lamudi.com.ph) enumerates the accomplishments of the five candidates for president—Mar Roxas III, Grace Poe-Llamanzares, Rodrigo Duterte, Jejomar Binay Jr., and Miriam Defensor Santiago—that have somehow affected the real estate industry. 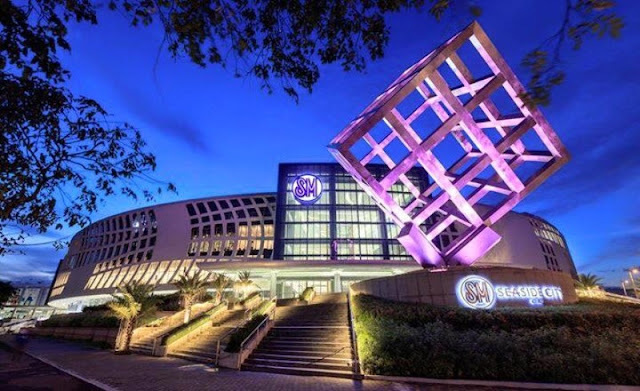 Global footwear brands Ipanema, Grendha, Rider, Zaxy, Anacapri and Söfft find their new Southern home at Cebu’s seaside lifestyle complex, SM Seaside City. Located inside SM Department Store, these brands offer trendy and fashionable footwear perfect for Cebu’s discerning market. 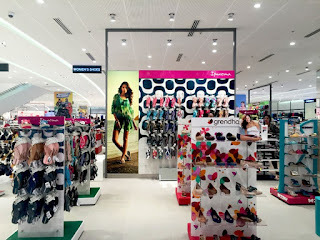 Exclusively distributed by ELRO Retail Corporation, these footwear brands feature a full range of stylish footwear products from flip flops to sandals all the way to comfortable flats and shoes all designed using innovative materials without sacrificing the latest fashion trends. This holiday season Cebuanos have more reasons to shop and be in fashion with Ipanema flip flops made from super soft and durable Flexpand 100% recyclable material. They can also enjoy Zaxy’s feminine patterns to keep young girls and teens feeling carefree, confident and stylish. For those who would like to bring out a classier look, they can slip on Grendha’s playful yet chic sandals and wedges. Anacapri’s trendy ballerina flats, on the other hand, will let them go around the city with utmost comfort and style. But for those with more refined taste, they can try out Söfft’s premium leathers to show off their sophisticated side. For men and women who are more adventurous, Rider footwear offers a line of trendy and durable sandals and thongs so they can enjoy their active lifestyles. These new brands definitely deserve a visit from Cebuanos who are looking for stylish, high-quality and comfortable footwear. For more information about the latest products, check out their Facebook accounts: Ipanema Philippines, Rider Philippines, Grendha Philippines, Zaxy Philippines, Sofft Philippines and Anacapri Philippines. Kyrie Irving is an inch taller and 20 pounds stronger than when he burst into basketball’s collective consciousness at the 2010 Nike Hoop Summit. Still, Irving hasn’t lost a step since his prep years in New Jersey. Through college and his early pro seasons, he has remained unrivaled in quickness on and off the ball. Irving attributes this advantage to a rigorous training regime. He tapped into this dedication to fast-track his recovery after fracturing his left kneecap during Game 1 of the NBA championship series in June 2015. 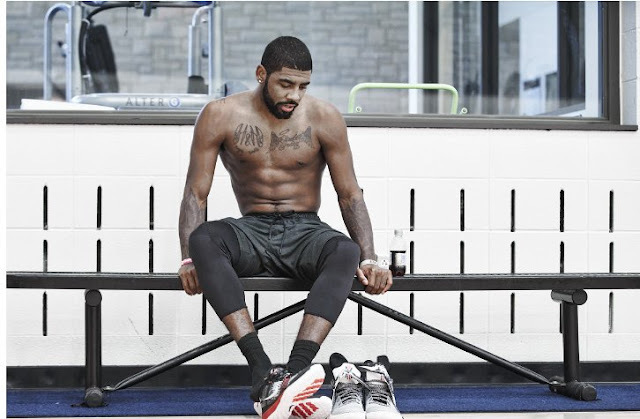 Instead of cutting back on training, he added a new series of isolated, weight-bearing dynamic exercises in the gym to complement his on-court workouts, which have been progressively approaching game speed. This recovery includes sweating every single day with his trainers, starting at 6:30 a.m., for two and a half hours prior to team practice at 10:00 a.m.
Iriving will make his season debut on Sunday against Philadelphia. Holiday shopping just got merrier as Citi, the country’s leading global bank, rewards its valued cardholders with a host of irresistible offers from the largest sports store chain in the country, Toby’s Sports. From now until January 2016, use your Citi credit card to avail of 0% Citi PayLite and get 15% discount on all regular-priced items on participating Toby’s brands. You can shop through a wide range of premium sports and fitness gear, and pay in easy, light monthly installments of up to 6 months. On top of the generous discount, Citi cardholders can get additional 5% on all fitness equipment worth P10,000 and higher. Make your athletic loved ones and fitness buddies happy this holiday season and treat them with Toby’s wide range of fitness equipment, including treadmills, exercise bikes, dumbbells, kettlebells, and weight benches at discounted prices. Plus, avail of Citi PayLite, Pay Later where cardholders can start paying up to three months later. You can take advantage for purchases of at least P3,000 of any regular-priced items from select brands of Toby’s. The participating brands include Newton, Lotto Footwear, Mitre, Core Fitness, RSL, Equipe balls, SGM Bikes, and Titans Boxing. Toby’s Sports offers some of the best sports and fitness gear from premium brands like Adidas, Nike, Under Armour, Rebook, Vans, Wilson, Prince, TYR, Speedo, Yonex, and RSL among others. For more information about Citi’s PayLite and Pay Later offers, log on to www.citibank.com.ph or call the 24-hour Citi Phone Hotline at 995 9999. For general information about Alaska Milk Corporation visit www.alaskamilk.com. 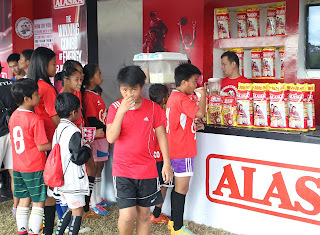 For general information about the 20th Alaska Football Cup visit www.alaskapowercamp.com/football; Like them on Facebook https://www.facebook.com/PlayPH for updates. Dozens of children battling different heart illnesses received stuffed toys and a lot of Holiday cheer from Jr. NBA/Jr. WNBA Philippines presented by Alaska this Christmas when Jarrell Lim, Jr. NBA Philippines All-Star and Alaska Goodwill Ambassador 2011 and Jr. NBA Coach Ruben Lanot visited the Pediatric Ward of Philippine Heart Center this December. Apart from the gifts, the UP Fighting Maroon guard and Coach Ruben encouraged the kids to continue their battle against their various conditions and played with them in their newly opened Play It Forward Play Space. Dr. Ina Bunyi, Section Chief, Pediatric Cardiac Rehabilitation of the Philippine Heart Center and her staff thanked the Jr. NBA Philippines representatives for coming and cheering up the young patients. “The toys and your words of encouragement made these young heart patients happy. 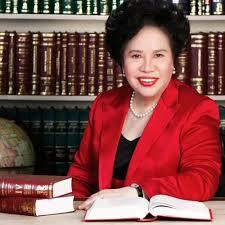 You have set them on the road to recovery,” she said. Above, Jarrell Lim (left) and Coach Ruben Lanot (right) offer a toy to a young heart patient as Dr. Bunyi looks on. Sports and Recreational Training Arena, otherwise known as SPARTA, once again heralds another first in the field of sports-facility management in the country. Come 2016, it is set to open the first and only triathlon concept store named, Maximus Athlete's Shop Café, which caters to Multi-sport athletes such as cyclists, runners, swimmers, as well as coffee connoisseurs. Owned by well-known triathlon Coach Andy Leuterio, Maximus will be a 280-square meter area, within the hectare-wide SPARTA facility, which will showcase different bikes, garments, equipment and accessories for Multi-sport athletes. Among the brands and products it will carry will be Lynskey titanium bicycles, Specialized bikes & accessories, Newton running shoes, Brooks running shoes, Muc-Off bike detailing supplies, CW-X compression gear, GoPro action cameras, Oakley eyewear, Knight composite racing wheels, Stages power meters, Kuat bike racks, Transition One apparel, TYR swimming gear, Swiftwick compression socks, Body Geometry FIT, among others. Andy Leuterio says that he got sold with the concept when he toured the SPARTA facility a couple of months ago and envisioned the concept store, which he named after his son, Maximus. He wanted a venue for Multi-sport athletes where they can buy their equipment, gear, accessories and get their bikes washed at the bike spa. Leuterio says, "While doing this, they can also have a sip of their specialty coffee as well at Maximus. We will be using Coffee Roasters specialty blends and single origin beans. After all, coffee and cycling go hand-in-hand." This is all in line with SPARTA's vision to "Influence everyone to get into wellness and active living. We call it #SpartanResolutions, and using this hashtag means committing one’s self to the Spartan lifestyle. I want to encourage everyone to go beyond a typical New Year's resolution and aim to create bigger and sustainable changes within yourself", says Amanda Fernandez, owner of SPARTA. "We will also launch our SPARTA Football Workshop for Adults with the help of Dream Big Pilipinas founder, Miguel Bermundo. 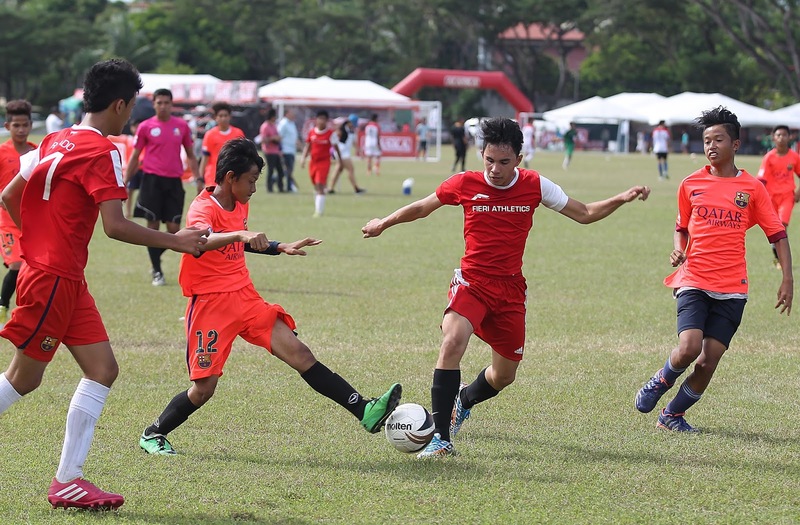 Dream Big Pilipinas is a football association in the Philippines that uses the sport of football as a catalyst for positive transformation among the youth in underserved communities”, adds Fernandez. The program intends to encourage adults to get into the sport of Football. As Fernandez says, "It is never too late for adults to get into football. The football field will be open 24/7 come mid-January anyway, and one can just drop by at SPARTA after work or even after a nightcap for a good football workout." Fernandez adds, "We also encourage everyone to try calisthenics at the SPARTA Calisthenics Academy, to boost their strength through body weight movements." SPARTA also has its Filipino Martial Arts classes, wherein students can learn the art of Kali, which has been used in Hollywood movies like 300. In the classes, students are taught how to defend themselves against knives and other weapons in street encounters. “The program also allows them to unleash their inner warrior. Everyone deserves to feel safe--whether at home or during a commute, and learning basic skills in our classes can do that”, says Fernandez. SPARTA initially opened early this year the very first FIFA 1-star indoor football field in the country. It also recently opened the SPARTA Calisthenics Academy last month, which had the very successful Battle of the Bars event, wherein contestants from different parts of the country trekked to the Mandaluyong sports-facility for the said event. Expect more from SPARTA this coming 2016 as it helps you unleash that inner warrior, with its #SpartanResolutions. For inquiries, please call 6553799. 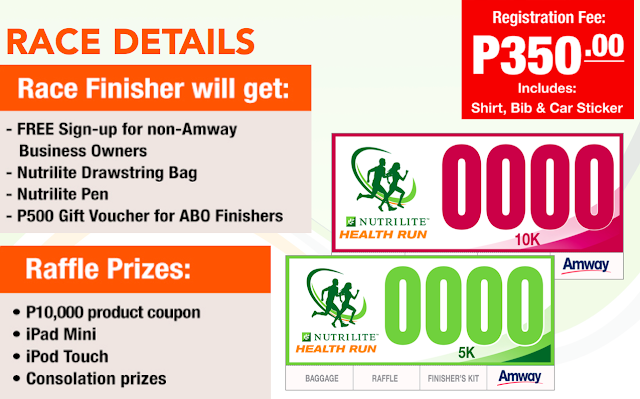 Organizer : Cosmic Gate Innovations Co.
Get ONE (1) Nutrilite Double X 6-Day Foil Pack for FREE when you sponsor a new ABO and activate with P1,500 worth of Nutrilite products. 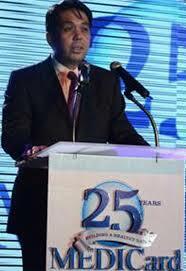 Cross Diokno Avenue to Sunrise Dr.
Start on Palm Coast Ave. beside Blk.12 parking lot to Seaside Dr. Right on Seaside Dr. to Diokno Ave. 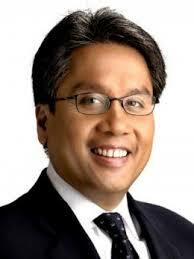 Right on Diokno Ave. to Sunset Ave. 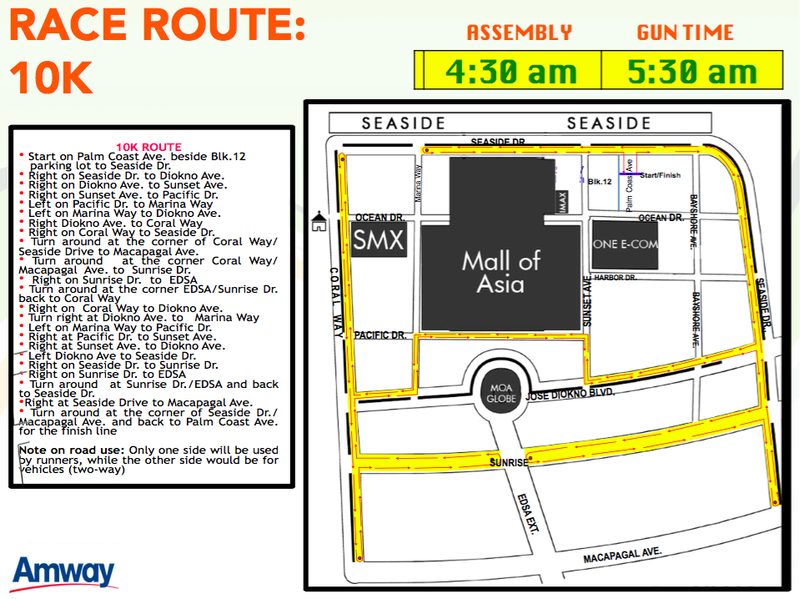 Right on Sunset Ave. to Pacific Dr.
Left on Marina Way to Diokno Ave. Right on Coral Way to Seaside Dr. Turn around at the corner of Coral Way/ Seaside Drive to Macapagal Ave. Turn around at the corner Coral Way/ Macapagal Ave. to Sunrise Dr. Right on Coral Way to Diokno Ave.
Left on Marina Way to Pacific Dr. Right at Pacific Dr. to Sunset Ave. 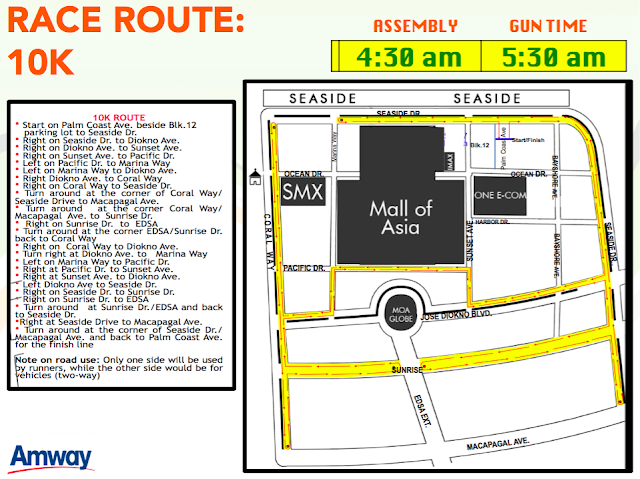 Right at Sunset Ave. to Diokno Ave.
Left Diokno Ave to Seaside Dr. Right on Seaside Dr. to Sunrise Dr. 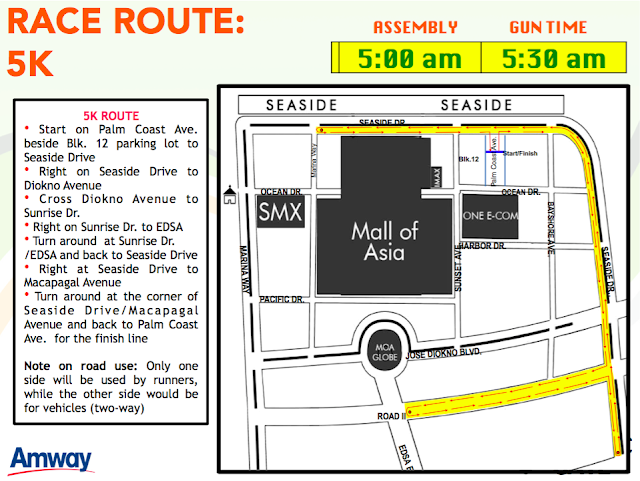 Turn around at Sunrise Dr./EDSA and back to Seaside Dr. 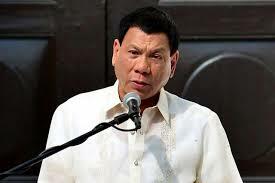 Right at Seaside Drive to Macapagal Ave.
“Filipinos are food lovers, and it is truly seen during Christmas season where greasy and high-calorie foods are served. Thus, it is just essential to burn those extra calories to avoid excess fat. For people who don’t want to hit the gym, they can try sports to burn the calories,” says Dr. Nicky Montoya, MediCard president. Swimming. Swimming gives an overall body workout and is great for toning muscles. Burning up to 800 calories per hour, swimming is one of the best choices if you want to shed those extra pounds for the holidays. If you have a pool or have access to one, it’s time to slip your swim suit on and do some laps. Racket Sports. Grab your racket and get ready to lose those calories you consumed during your Christmas parties. Racket sports such as tennis and badminton are fun sports you can do with your loved ones. Building lower body strength and endurance, as well as burning up to 900 calories per hour make racket sports an excellent workout options. Martial Arts. Learn self-defense and burn calories while practicing martial arts. Whether judo, tae kwon do or muay thai, martial arts has you moving quickly and in a variety of ways. It is sure to help you tone muscles by burning up to 1,100 calories per hour. Running. This may be the most accessible sport you can get your hands on. Burns up to 1,500 per hour, running is an ideal sport which works every part of your body, from your calves and quads to your abs. For the best-calorie burning potential, try to keep your speed above 8 mph. Boxing. Wear those boxing gloves and be game enough to step into the ring. Whether it’s kick boxing or in the ring, boxing is one of the best sports to participate in since it burns up to 800 calories per hour. Basketball. Aside from burning up to 900 calories per hour, playing basketball lets you develop flexibility, endurance and cardiorespiratory health. But, make sure that you warm up properly before stepping on the court to avoid injuries. 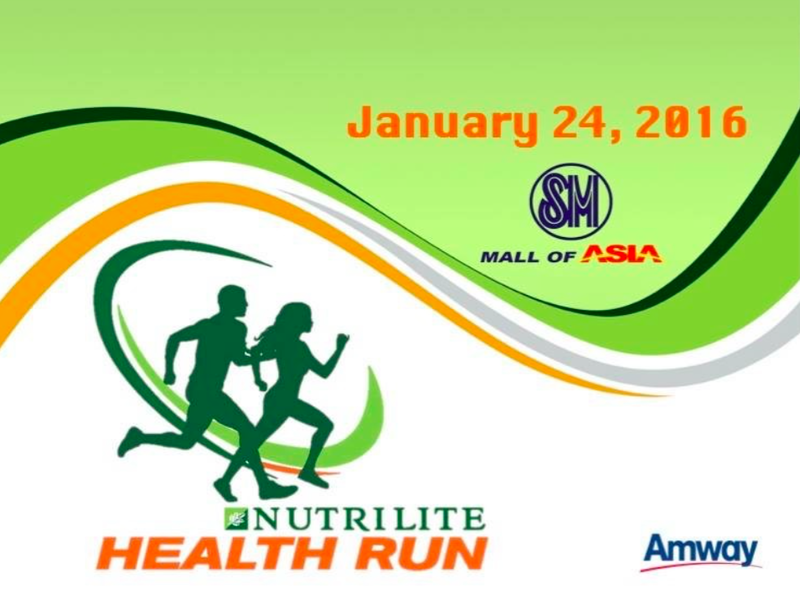 Shed those calories for the holidays! Visit MediCard’s fitness facility at #51 Paseo De Roxas cor. Sen Gil Puyat Avenue, Makati City. For more information, check out their website at www.medicardphils.com. Basic home furniture and everyday items get a fresh, modern take and find harmony between function, practicality and design as Men of Design Matt Carr of Umbra; Arno Ruijzenaars of Leff Amsterdam; and Kenneth Cobunpue take the spotlight at the “Contemporary Design Showcase”. The Contemporary Design Showcase features the masterpieces of the three esteemed designers who represent their globally-recognized brands in contemporary home furnishing. Matt Carr of Toronto-based homeware design company Umbra who is for his signature designs that can be distinguished by subtle design detail, style references and the reinvention of traditional objects. Arno Ruijzenaars of clock master Leff Amsterdam pushes the boundaries to create timepiece which exposes elements of construction such as the Tube Clock. Kenneth Cobonpue, a renowned Filipino furniture designer, is known for his masterpieces made of natural materials such as rattan, bamboo, abaca, and buri palm such as the Yoda chair. Men of Design Matt Carr, Arno Ruijzenaars and Kenneth Cobonpue prove that in the world of artistry, design knows no gender. It is the sensibility of the artists that is always at the core of every masterpiece. And in these modern times, the perfect marriage of beauty and function is the common principle shared by designers across the globe—or the force that binds Umbra, Leff Amsterdam and Kenneth Cobonpue. Catch the works of these design masters at the Kenneth Cobonpue Showroom located at The Residences, San Lorenzo Tower, Greenbelt, Makati City. 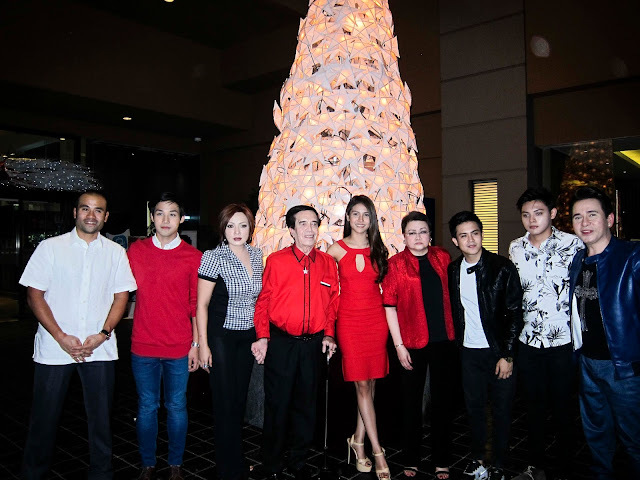 Christmas came alive at Greenhills Promenade and Theater Mall with the official Christmas Lighting ceremony on November 26 when hot young stars Ken Chan of GMA’s Destiny Rose, Jake Vargas, Prince Villanueva and Sanya Lopez joined Music Museum Group president Precy M. Florentino and other MMGI officials in switching on hundreds of glittery parols. They were joined by Kuya Germs, German Moreno, Walang Tulugan co-hosts Jon Knight and Sharmaine Santiago, Music Museum Group Vice Presidents Paolo F. Mendoza and Rosalina F. Mendoza. The Christmas lighting ceremony is an annual tradition in this part of Greenhills that is enlivened by the presence of stars and entertainment personalities. The dining, shopping and entertainment enclave is best known among leisure lovers for its favorite performance venues, the Music Museum and Teatrino, its glam Greenhills Cinemas, the first movie theaters in the country to show movies in state of the art sound technology, Dolby Atmos and its lively mix of shops and restaurants. The lighting ceremony also touched off a series of engaging Christmas activities at the Promenade and Theater Mall. 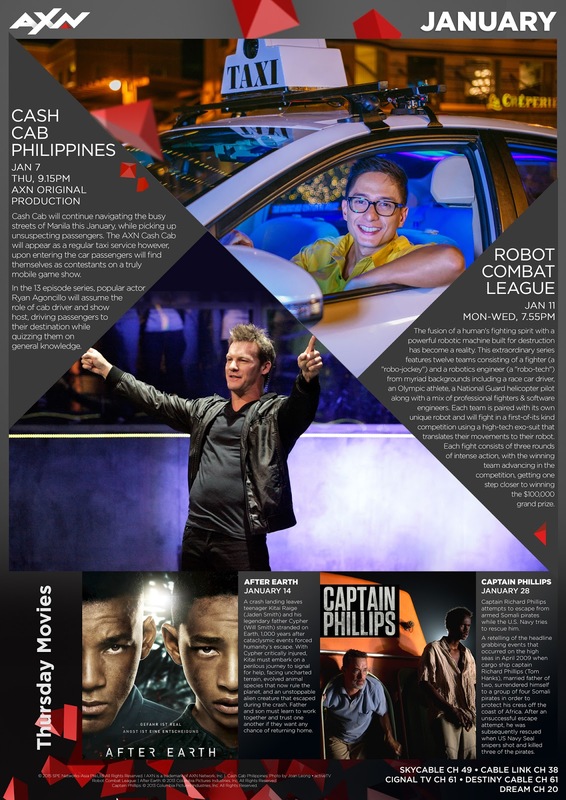 The Teatrino Film Series, a Philippine independent movie festival put together by Heneral Luna director Jerrold Tarog in September 2014, continues to regale moviegoers with weekend movie treats at the Teatrino up to December 19. Jerrold Tarog’s film, Senior Year; Sleepless by Prime Cruz and Alagwa by Ian Lorenos were first to screen on December 12. On December 19, Alvin Yapan’s Ang Sayaw ng Dalawang Paa starrng Rocco Nacino and Paolo Avelino comes back to haunt all lovers of dance, beauty and gender equality. 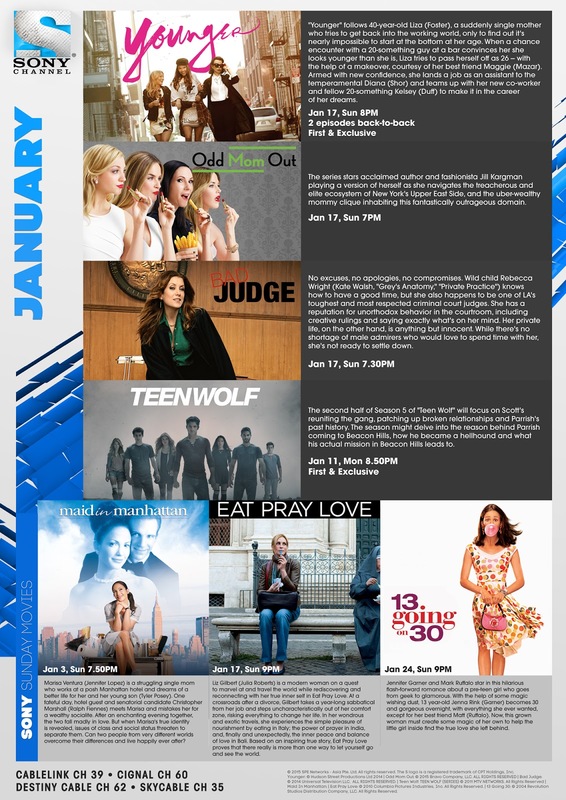 Mihk Vergara’s Patintero : Ang Alamat ni Meng Patalo goes on at 7 p.m., while Jason Paul Laxamana’s Magkakabaung starring Allen Dizon and Gladys Reyes closes the Film Series festival for 2015 at 9:30 p.m. Tarog’s Sana Dati, Sigrid Andrea Bernardo’s Lorna, Pepe Diokno’s highly acclaimed Above the Clouds showed in late November. On December 19 a Star Wars exhibit featuring rare Star Wars toys and memorabilia will be held at the new Promenade Hall. Shoppers may join the X-Wing Game Tournament and witness the launch of the Darth Vader Annual #1 at the venue. Renowned Filipino comic book artist Leinil Francis Yu of Marvel Comics will have an autograph signing session for comic book fans. A Cosplay Contest will excite shoppers on the same day and exhibit goers get free movie tickets for special screenings of Star Wars: The Force Awakens, plus other freebies. On December 21 and 22, the music of Charlie Park and K-Pops! will liven up afternoon Christmas shopping and leisure activities as the Korean group performs for holiday shoppers and passers by at the Greenhills Promenade and the Theatre Mall at 5:30pm. 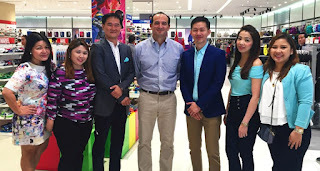 Manila, Philippines (2 November, 2015) — In this modern digital age, even the tech-savvy among us admit that they too can get easily get lost in the sea of products and devices that are advertised to be the supposed latest ‘game-changer’ in the tech industry. And as such, nowadays one must be even more vigilant in choosing what kind of smartphone that can really keep up with his basic needs. And with the Holiday rush clearly in full-swing already, we are out to lend a helping hand by conveniently listing down and summarizing these factors into the four basic yet important must-haves – some often overlooked – that would make just anyone and everyone’s lives easier when deciding what particular smartphone they should purchase. At the end of this brief and informative article, you will surprise yourself by now wisely knowing what specific factors and features you would first want to consider before purchasing that smartphone really meant for you. Random Access Memory, or RAM, is the smartphone part that few of us think about, and yet it’s absolutely vital to everything we do. If your smartphone lacks memory then your stuff will soon slow to a crawl — and that’s why we recommended a smartphone with at least 1GB of RAM. Why 1GB? Because apps are always growing in size, so you need enough memory to run everything you want. With a 1GB smartphone, such as any ASUS ZenFone model, you’ll have plenty of RAM to spare — even with all these apps running. On a lesser model, with just 512MB of memory, you’ll pretty much have reached the limit! If you think you’ll need more RAM and even better performance then consider a smartphone with 2GB RAM or more. The Android 5 (Lollipop) operating system, for instance, gobbles up loads of of memory just for itself — so 2GB gives Android and everything else on your smartphone more room to work. Also, some of the newest applications out there demand a lot of memory to run properly. So, remembering our table above, a smartphone with 2GB RAM would leave you 1.6GB left to run more apps — and that’s plenty for most things you’ll want to do! Now this example below considers an 8GB smartphone with lots of popular apps in use and with typical storage requirements, leaving a comfortable 2GB of storage remaining to play with. Now imagine this same suite of apps on a 4GB handset — and you’ll see why you need to avoid such devices! Only with this about of storage will you be able to download, install and run the apps you want, and allow them the space they need to expand as you use them. It’s also the only way to ensure you’ll be able to update to newer versions of Android, when they become available. And while we’re here, we should say that ideally you should go for a device with more than 8GB of storage — but now you understand why 8GB is the absolute minimum! A smartphone that can see in the dark? They exist — if you shop wisely! With a good low-light feature, you’ll capture great photos even when illumination is at a minimum, ensuring your subject is clearly visible and without noise or blur. It’s bad when photos look washed-out because the smartphone’s LED flash compensates for skin tone. That’s why a smartphone with a dual-tone LED flash is very important, as it allows the smartphone to deliver the perfect light combination to keep skin tones looking beautifully natural. Dual-LED features have different names, such as Real Tone flash. It is best if your smartphone has a manual mode that allows you to control every aspect of its camera. With this feature you can fine tune the shot for every scenario, and apply creative effects that you’ll never experience from automatic mode alone. And after all of the above, take into consideration the megapixel – because more of them means more detail captured. Also look for features like ‘Super Resolution’, which combine multiple shots into one ‘Super Resolution’ photo for incredible detail. o Does the smartphone have a power-efficient processor? Many low-cost smartphones have inefficient processors that also produce a lot of heat. o Is the antenna engineered to acquire the best reception? This is important because if your smartphone has a bad signal, it’ll use more power — and that’ll reduce the battery life. o Has the manufacturer installed bloatware? If your smartphone is pre-loaded with lots of useless apps, they could be consuming power in the background — so buy a device that lets you remove unwanted apps. o Li-polymer don’t suffer from the ‘memory effect’, so can be charged at any time with degrading usefulness. For the latest information on the ASUS ZenFone 2 product portfolio series, may refer to http://bit.ly/IncredibleHolidaysMobile.